New Parkway Theater reopened Movie, Pizza AND Beer? As you may have heard the Parkway Theater has reopened. I would love to say that’s true but not entirely. 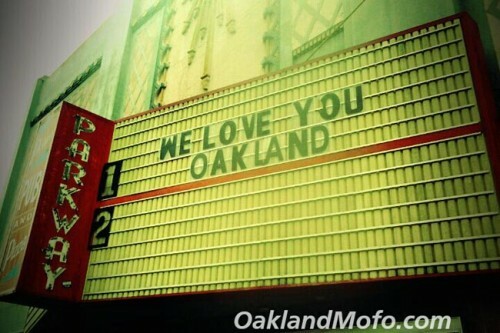 There is actually a new group who signed a lease at a new venue in Oakland’s Uptown District at 474 24th St.
We Love You Oakland sign at the closed down Parkway Theater on Park Blvd. However it is now officially reopened and you can enjoy the same vibe as before! So pretty much the same idea with new people and a new place. Hardly the Parkway reopening as the rumors were flying. But good news nonetheless. As for the new group it did open in December 2012. I personally do not like it when compared to the original Parkway Theater. The inside shape is more of a box than a movie theater set up. I felt the rail to be in the way up top if you were comfortably leaning and if you got there late you would be stuck to the side.